This paper reports on a case study* that explores the possibility of reproducing a destroyed historic site from its remaining artefacts. Using VR (virtual reality) technologies, we construct a series of low-end, 3D models that are navigable through the Web. This gives us the opportunity to visualise, explore and present ancient sites in their original form. We focus mainly on the Hawara Labyrinth site. However, the method developed is generic in that it is applicable to other sites and artefacts that require reconstruction and dissemination using digital technologies. The feedback from this pilot project will be integrated into an on-going project** on creating online learning and teaching resource. * This report is based on a short-term project supported by the Graduate School, University College London. A version of the project output can be obtained from http://www.casa.ucl.ac.uk/digital_egypt/hawara/. **Digital Egypt for Universities is a three-year project to create online learning and teaching resource, funded by JISC (the Joint Information Systems Committee) that is currently carried out by Centre for Advanced Spatial Analysis, University College London, and the Petrie Museum of Egyptian Archaeology, University College London. There has been much discussion about the capabilities of the Internet and cyberspace to promote increased accessibility to museum collections (Economow 1995, Johnston 1998). Potentially, visitors can indulge in virtual experiences of artefacts to which access in a real museum is limited by physical distance, conservation requirements, or limitations on exhibition space. In the virtual museum, the collection in the museum is available at any time online (Sweeney 1997). In addition, the flexible nature of such virtual environments can be further utilised in reproducing full-scale, 3D models of archaeological sites. In particular, we can adopt VR technology to generate a virtual reconstruction of an ancient site that was destroyed long time ago. This is of immense importance for archaeological studies as it opens up many new dimensions in understanding and simulating such sites. Perhaps for the first time in archaeological terms, does it provide us with the opportunity to visualise, explore and present ancient sites in their original form. We may even be able to create dynamic models which incorporate chronological transitions and reflect the cultural and physical shifts that have taken place at each time period. In other words, one of the effective ways to promote and provide archaeological resources online is to address the limitation on exploring real artefacts by creating a virtual archaeological site equipped with 3D visualisation utility. It should be complemented by web interface that includes the relevant information, so as to attract the user's interest and lead them to the models. In this light, we set up a project on the VR modelling of ancient sites and propose a series of digital reconstruction, which is developed and disseminated using state-of-the-art digital technologies. We then popularise it in a web-based context so that various publics could view the exhibits as well as consider various reconstructions for themselves. As a short-term case study, we focus on the Hawara Labyrinth site for which we have primary access to a wealth of artefacts and archaeological records. However, the techniques we develop would be of wide use in archaeological reconstruction; this study in fact is the pilot phase of a much larger project which is aimed at realising the full potential of these new media in archaeology and museum planning. We will start by discussing the applicability of VR to archaeology. This is followed by revisions on some of the related studies. We will then trace the history of Hawara and examine how it was gradually destroyed. Based on this information, we construct online contents of Hawara including two models of the Labyrinth that are proposed by different archaeologists. Information technology has contributed to archaeology from innumerable different aspects. For instance, geographic information system (GIS) supports the excavation process through the provision of geo-reference data. Moreover, owing to the exponential growth of the Internet and the rapid advancement of VR, there is now vast potential for assisting excavation and reconstruction of historic sites as well as disseminating the relevant information to a wider public (Batty 1997). Indeed, technology has come a long way in solving many of the early limitations of VR; Virtual worlds have quietly found growing acceptance in selected areas, from research to industrial training, entertainment, and medicine. Less than a decade ago, however, issues of graphic quality and speed troubled virtual world developers, forcing simplistic representations and triggering criticism from the heritage community (Addison and Gaiani 1998). In addition, until recently we were short of inexpensive software and data standards for creating visually realistic interactive environments. The development of VRML (Virtual Reality Modelling Language) in 1994, the de facto standard 3D descriptive language, has broken the technical barrier and enabled the visualisation and distribution of 3D models on-line (Pesce 1996). We adopt VRML97 as a primary means to visualise texture and create 3D models. This however, is complemented by other form of online material such as movies and still images so as to allow low-end users to access the contents and to deliver it to a wider audience. Our primary aim is to virtually reproduce the historic site of the Hawara Labyrinth which was built around 1800BC. Today the site resembles a moonscape, following its destruction in the first millennium AD. We thus have no clear picture of the plans of the entire Labyrinth or the cemetery; nor do we know their design or proportions. Nevertheless, with the aid of VR technology, we are able to devise visualisations of different probable forms. We also benefit significantly by the fact that many of the artefacts excavated from Hawara are now conserved at the Petrie Museum and that we have hands-on access to these artefacts as well as the archaeological records by Petrie. Reconstruction of ancient cities to exploit the medium - this includes successive historical phases of a single place as well as developing a range of possible forms where the original form is uncertain. Spaces for an ideal exhibition space - using the medium to plan in the 3D space various future plans of museum layout which would best cater for the display of the artefacts. As aforementioned, this project focuses on the single example of the Hawara site, but the methodology is generic and therefore applicable to the reproduction of other sites, at different time periods and reflecting very different collections of artefacts. 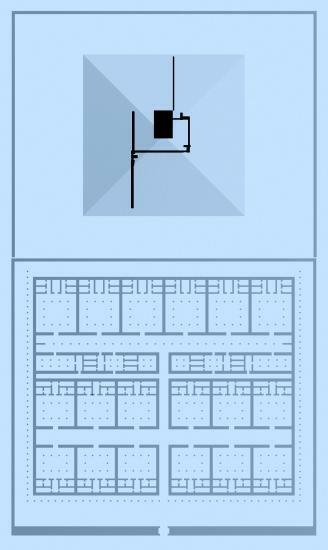 Furthermore, the techniques we evolve may also find use in many other historical and artistic contexts where visualisation of unknown structures is the goal. In archaeology, the Web is mostly used as a medium to introduce certain projects, or to swiftly provide preliminary reports from excavations. In some cases, the web contents are edited on the site; one of such examples being the Theban necropolis expedition led by Nigel Strudwick (http://www.newton.cam.ac.uk/egypt/tt99/). Some attempts have been also made on Internet publications which include the following two initiatives in the Netherlands: the Coffin Text database (http://www.ccer.ggl.ruu.nl/ct/ct.html) and the Deir el-Medina database (http://www.leidenuniv.nl/nino/dmd/dmd.html). Both are designed mainly for philologists. Also, a few novel attempts have been made recently in the field of virtual preservation and reproduction of historical or heritage sites (Addison and Gaiani 1998). These include the virtual conservation of a large scale, ancient site such as Angkor Vat in South Asia and the Roman site of Sagalassos, south-west Turkey (Pollefeys et al. 1998). However, most of these projects aim to reproduce an existing site or to construct a realistic model where the original plan is known. In this project, we propose a generic method for visualising the possible forms of a historic site whose form is uncertain, and which has to be estimated from the few remaining artefacts. At the Petrie Museum itself, there is an ongoing project involving the digitisation of the entire collection for dissemination using web-based technology. This project includes an association with the University of Manchester and has been funded by the Museum and Galleries Commission under the Designated Museum Challenge Fund. In terms of virtual museums, there are a number of projects and studies relevant to the future planning of galleries in the virtual environment. Currently, there are over 500 web sites and projects that relate to the electronic reproduction of a collection of digital artefacts and information resources for public exploration in the form of a museum-like environments (Shiode and Kanoshima 1998). Using VRML and the proprietary technologies, some museums have already reproduced their galleries either partially or entirely in 3D visual form; the Philadelphia Museum of Art (http://www.libertynet.org/pma/) and the Hara Art Museum (http://www.haramuseum.or.jp/) to name but two. Nevertheless, as their primary intention is to imitate real museums, existing virtual museum contents appear similar to 3D CAD models and do not surpass the presentations of traditional museums, nor do they explore the potential for exploring the possible form of ancient archaeological sites (Worden 1997). Before we move onto the modelling and dissemination of the online contents, let us brief on the study area. Hawara is a cemetery site in the southeastern Fayum region, about 80km south of present day Cairo. It is the burial place of Amenemhat III, the last great king of the 12th dynasty (about 1855-1808 BC). To the south of the pyramid the king constructed a large cult complex (approximately 120 metres by 300 metres), in which the king was worshipped as a god. The complex was most probably built in the second half of his reign, and seems to have been called Ankh-Amenemhat. After some 1500 years, king Amenemhat III was still attested as a god in the Fayum region, especially in Hawara and, during the period of Classical Antiquity, the cult complex of the king came to be known as the "Labyrinth" (Arnold 1980). The Greek historian Herodotus, who visited the temple in the 5th century BC, described a building complex with three thousand rooms connected by winding passages. Later Strabo visited the temple about 25 BC and also described an amazing building. Pliny the Elder gives the longest report on the "Labyrinth" even though he never saw it himself and was probably mixing direct observations from other authors with his own imagination of what he thought a Labyrinth might be. Since Ptolemaic times, especially under the Romans, the complex was used as a quarry and hence has mostly disappeared (Lloyd 1970). In Late Antiquity, the complex was considered as one of the wonders of the world. The Renaissance stimulated rising interest in Antiquity, and brought back into circulation classical authors such as Herodotus. As a result, once again people became interested in the Egyptian Labyrinth. The scholar Athanasius Kircher produced one of the first pictorial reconstructions, mainly based on the account in Herodotus. At the centre of his architecture drawing, Kircher placed a maze, most likely to have been inspired by Roman labyrinth mosaics, and surrounded it with the twelve courts described by Herodotus (Kern 1995: fig. 63). Around 1840, the original Labyrinth site at Hawara was rediscovered by the Prussian expedition of Richard Lepsius (Lepsius 1849). Lepsius thought that the structures excavated by his team were parts of the temple of King Amenemhat III, but later research showed that they belonged to Roman tombs. Since the expedition of Lepsius, the place came to be known as a findspot for some high quality royal statues. In 1888, Flinders Petrie started to excavate at Hawara. The results of his work on the Labyrinth itself were disappointing for him. Since Roman times the whole building had been totally destroyed, and he was unable to recover any part of the complex. Sensationally though, he found a series of portrait panel paintings, depicting the local elite in the period of Roman rule (Petrie 1889, 1890). With these findings, he restored to classical art history a field that had been virtually unknown until then. In 1911, Petrie returned to Hawara to excavate in the Labyrinth and to find more of the so-called Fayum portraits on the Roman Period mummies. As usual, Petrie published his results soon after his work and also depicted partial reconstructions of the complex within his volumes. These were still mainly based on the classical authors, and only few points depended on the little evidence he found for the original architecture (Petrie et al. 1912). Since Petrie’s excavations in 1911, no official excavation has been carried out in the Labyrinth, though some shorter expeditions from the Antiquity Service have dug in the necropolis of Hawara. Apart from some short notes in Egyptological journals nothing has been published from these excavations. Only this year a Belgian mission began a survey of the site, which has already begun to produce more accurate information. This should advance the research by colleagues such as Dieter Arnold (Arnold 1979, 1980), Ingrid Blom-Boer (Blom-Boer 1989), and Eric Uphill (Uphill 2000), who have published much stimulating work on Hawara (Figure 1). Figure 1. 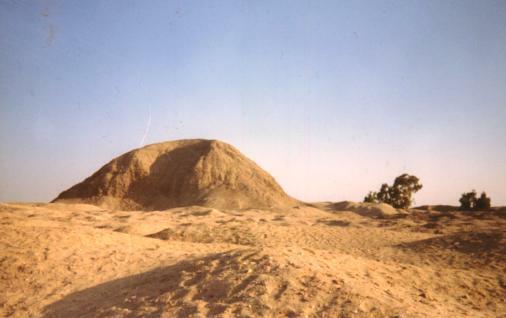 The pyramid of Amenemhet III at Hawara (Image courtesy of Christiane Mueller-Hazenbos). The fact that the Labyrinth was destroyed long time ago makes it almost impossible to depict its original form. Even its scale is still under dispute, and to a greater extent, we have to rely on older references such as the description by Herodotus as well as on brief archaeological notes from earlier excavations. In our project, we produced two versions of the Labyrinth model in VR. Soon after his second expedition, Petrie published a partial reconstruction of the Labyrinth (Figure 2a). It consists of 18 large chambers separated by three main corridors, two running sideways and one at the centre. Because he did not find enough evidence, these are considered to be primarily based on the classical authors, and only few points depended on the little evidence he found for the original architecture (Petrie et al. 1912). Taking his plan for granted, we measured his drawings and redrew the plan as shown in Figure 2b. Heights were taken from another tomb chapel constructed by King Amenemhat III assuming that he used the same module. 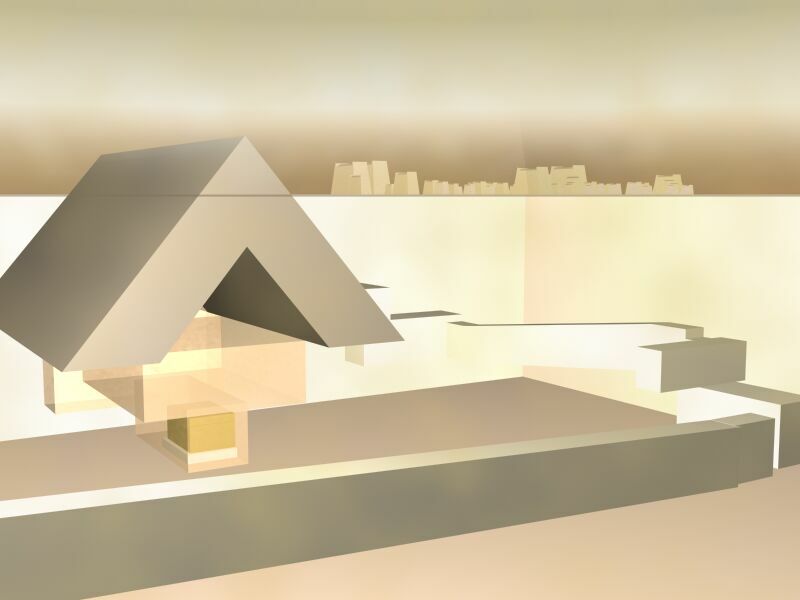 The model was then constructed in 3D Studio Max, a 3D Computer Aided Designing (CAD) package in its proprietary format, exported to VRML97 format, and manually edited to give it the right scale and light setting. The result is shown in Figure 3. Figure 2. 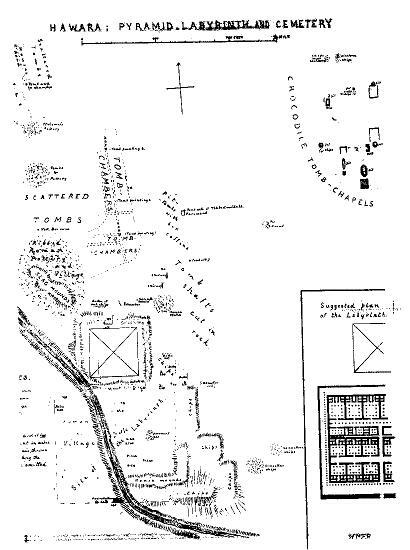 (a) A plan of Hawara in late 19th century and a partial diagram of the predicted structure of the Labyrinth hand drawn by Petrie, and (b) The plan of the Petrie model of the Labyrinth produced in the project. Figure 3. A 3D model of the Labyrinth based on a drawing by Petrie (1890). Based on some recent results and proposals, we have come up with an alternative to the Petrie model. The overall shape of the Labyrinth itself is based on the study by Arnold (1979) who assumed that the building follows the tradition of the Djoser complex in Saqqara. A large open court was placed in the front section, similar to that of the Djoser complex. The small twelve open courts at the back are based on the description by Herodotus. There are also five chapels in this model, which are common for pyramid complexes in the Old and the Middle Kingdom. The pyramid was also decorated with two temples, one in the north and the other in the east side. These are based on the fact that traces of the temple to the north of the pyramid were still visible in the 19th century, and the one to the east of the pyramid is seen on parallels. Figure 4 shows a bird's-eye view of this second model. The columns are decorated in such way that they resemble the ones that are found in a well preserved example from the same period. Figure 4. An alternative 3D model of the Labyrinth based on recent observations (Arnold 1979). There are several important finds excavated in Hawara other than the Labyrinth. 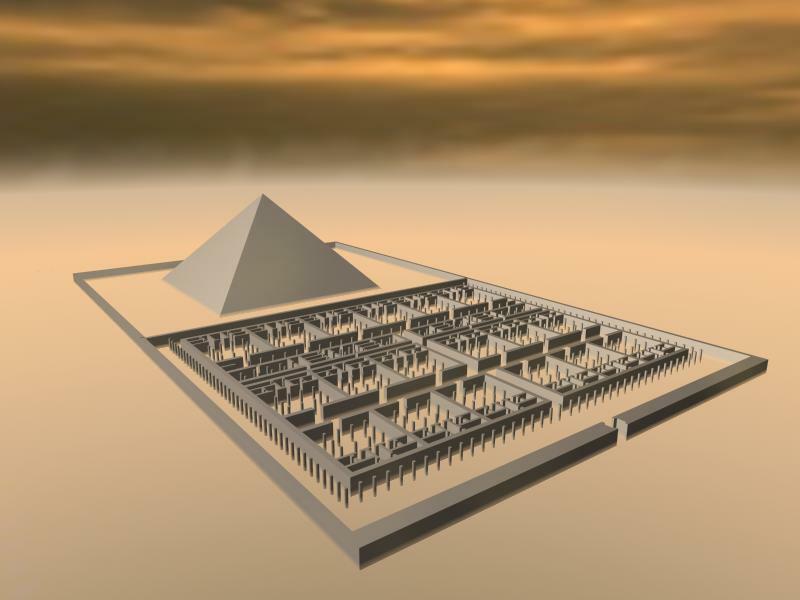 We have modelled some of the structures, including the pyramid itself, and have also included other relevant information in our Web interface. The following highlights some of the more significant contents. Figure 5 shows its internal structure at the centre of which lie the sarcophagi of King Amenemhat III and his daughter. 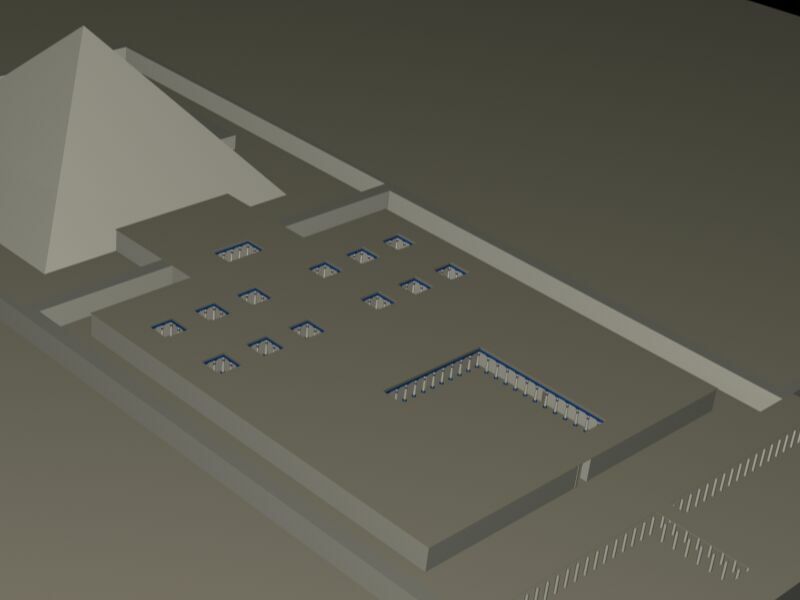 The figure also shows a group of 12th dynasty century tomb chapels later constructed towards the back of the pyramid. One of the smallest yet best-recorded tombs is that of a woman named Satrenenutet. The surviving finds from her tomb are preserved in the Petrie Museum, and the notebook and publication permit a reconstruction of the original appearance (Figure 6). Figure 5. A 3D model of the internal structure of the Hawara pyramid (measurements taken from Petrie 1889). Figure 6. A 3D model of the tomb of Satrenenutet (12th dynasty). The artefacts are preserved at the Petrie Museum. 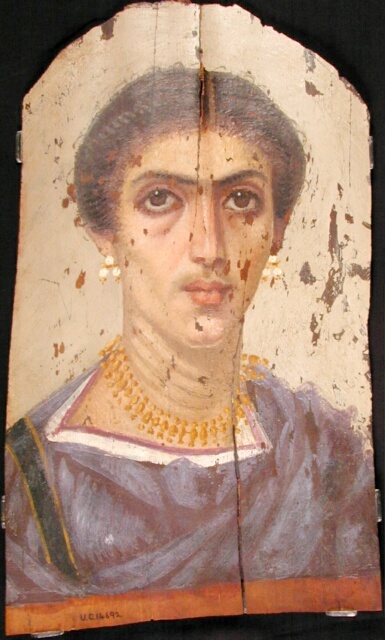 Another important finding in Hawara is a collection of Roman period mummy portraits. Petrie (1890) recovered about 180 of these extremely fragile paintings, the largest group found in excavation and one of the most important discoveries for classical art history. Figure 7 shows one of the 41 portraits preserved at the Petrie Museum. The spatial constraints in the University gallery permits only nine of them to be displayed, but the entire portrait collection is archived and can be seen through our Web interface. Figure 7 incidentally shows one of the many non-displayed portraits which may not have been disclosed if it were not for the Web resource. (preserved at the Petrie Museum). Finally, the northern cemeteries at Hawara, and probably also the village south of the pyramid, were continually used after the official conversion of the Roman Empire to Christianity in the 4th century AD. In 1888, workmen brought to Petrie the finds from some rich burials of this date, including one apparently of a child for which the grave goods are preserved in the Petrie Museum (Figure 8). They offer an instructive contrast to the finds from the tomb of Satrenenutet, though the position of the objects around the body or bodies was not recorded for the late burials. Figure 8. 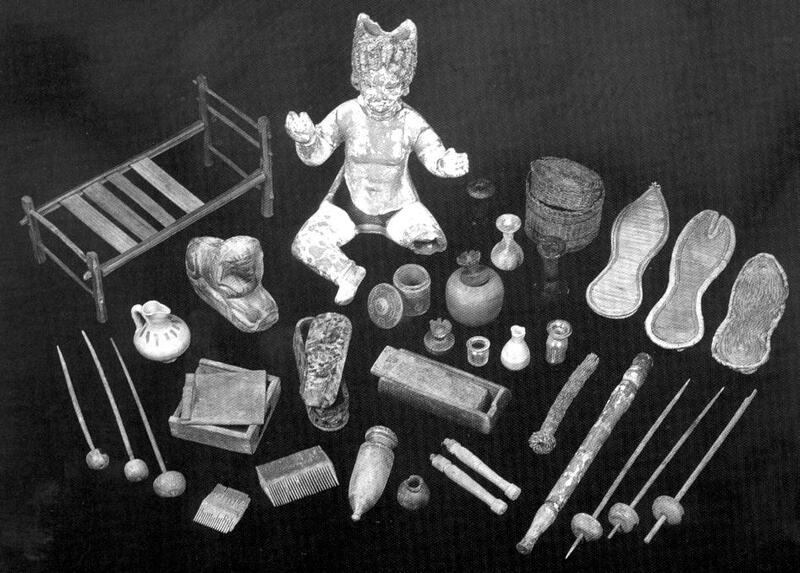 Toys and other objects found in a tomb (later second century AD). In this project, we proposed a case study for distributing an online resource of an ancient Egyptian site. In particular, we constructed 2 versions of VR model of the Hawara Labyrinth and presented its probable forms in 3D. The first reconstruction of the Labyrinth is based on a drawing by Petrie, and the second based on parallels from other mortuary temples of Pharaonic times as well as descriptions by classical authors. The models were complemented by Web interface where information relevant to the model and other data on artefacts were provided. We may argue that the Petrie model looks "less Egyptian" in our contemporary interpretation, and that the second version seems to more accurate. However, both examples retain the right to be claimed as the correct reconstruction of the Labyrinth, for we do not and probably would never know for sure, what it really was like. The project provides a generic approach in several different areas. This project opens the door to exploration of spaces that have been lost and their structure unknown. Unlike more complex design tools, VR solution provides a range of possible options for combining existing artefacts and reconstructing entire sites from existing artefactual evidence. This approach is not only be useful to the experts who seek a modelling tool for their field of study, but is also useful to the wider public who are potentially interested in the appearance of ancient sites. The temporal aspect of this research is also important, in that it enables us to build models of different periods. This could help in investigating transitional shifts associated with specific sites, especially when building a model of an archaeological site that has undergone transitions in its physical form as well as its culture. From the museum-studies point of view, the project contributes by providing insight into how museums can use the full potential of web-based technologies to provide its resource in completely different modes of understanding and interpreting collections. There is also the potential in this approach to display and combine items from different collections in the same reproductions or reconstructions, and to explore different arrangements and interpretations of the same sets of artefacts. In terms of our future output, we may further employ the potentials of VR space by developing a flexible and dynamic modelling system where users can visualise and explore interactively as they wish. The use of the virtual environment as a flexible, dynamic space is highly significant for it is fundamentally applicable to many other fields. 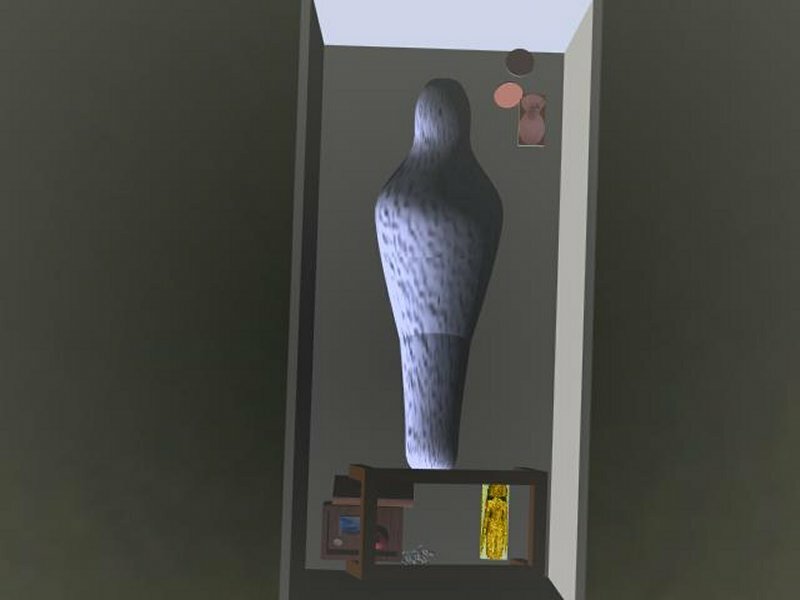 In fact, enabling users to actively interact with the objects and arrange them in a virtual space that best suits their imagination, while moving the objects around and substituting them with new ones, is a radical challenge to the traditional control of exhibitions and information by curators. We are currently building on the experience gained through this case study and are creating online learning and teaching resource under a three-year research project scheme. We would like to thank Dr. Stephen Quirke of the Petrie Museum of Egyptian Archaeology, University College London, for his suggestion on selecting Hawara for treatment and his many valuable comments. Addison, A.C. and Gaiani, M. 1998. 'Virtualized' architectural heritage - new tools and techniques for capturing built history, in Thwaites, H.(ed), Future Fusion: Application Realities for the Virtual Age, IOS Press, Amsterdam, pp.17-22. Arnold, D. (1979). Das Labyrinth und seine Vorbilder, Mitteilungen des Deutschen Archäologischen Institus Kairo, vol.35, pp.1-9. Arnold, D. (1980). Labyrinth, Lexikon der Ägyptologie III, pp.905-908. Batty, M. (1997). Virtual geography, Futures, vol.29, pp.337-352. Blom-Boer, I. (1989). Sculpture fragments and relief fragments from the Labyrinth at Hawara in the Rijksmuseum van Oudheden, Leiden, OMRO, vol.69, pp.25-50. Economow, M. (1995). Museum collections and the information superhighway, Spectra, vol.23(1), pp.7-9. Johnston, L. (1998). Imaging in museums; issues in resource development, in Jones-Garmil, K. (ed. ), The Wired Museum, American Association of Museums, New York, pp.93-114. Kemp, B.J. (1989). Ancient Egypt: Anatomy of a Civilization, Routledge, London. Kern, H. (1995). Labyrinthe, Prestel-Verlag, Munich. Lepsius, R.(1897).Denkmäler aus Ägypten und Äthiopten, Textband I, 46-48, (E. Naville ed) Berlin. Lepsius, R. (1849). Denkmäler aus Ägypten und Äthiopten, II, 11-30, Berlin. Lloyd, A.B.(1970). The Egyptian labyrinth, Journal of Egyptian Archaeology, vol.56, pp.81-100. Michalowski, K. (1968). The labyrinth enigma: archaeological suggestions, Journal of Egyptian Archaeology, vol.54, pp.219-222. Pesce, M. (1996). VRML: Browsing & Building Cyberspace, New Riders, Indianapolis. Petrie, W.M.F. (1889). Hawara, Biahmu and Arsinoe, Field & Tuer, London. Petrie, W.M.F. (1890). Kahun, Gurob and Hawara, Field & Tuer, London. Petrie, W.M.F., Wainwright, G.A. and Mackay, E. (1912). The Labyrinth, Gerzeh and Mazghuneh, (British School of Archaeology in Egypt and Egyptian Research Account, 18th Year), Bernard Quaritch, London. Pollefeys, M., Koch, R., Vergauwen, M. and Gool, L.V. (1998). Virtualizing archaeological sites, in Thwaites, H. (ed. ), Future Fusion: Application Realities for the Virtual Age, IOS Press, Amsterdam, pp.600-605. Shaw, I. And Nicholson, P. (1995). British Museum Dictionary of Ancient Egypt, British Museum Press, London. Shiode, N. and Kanoshima, T. (1999). Utilizing the spatial features of cyberspace for generating a dynamic museum environment, in Spencer, S.N. (ed. ), Proceedings for VRML'99 - Fourth Symposium on the Virtual Reality Modeling Language, The Association of Computing Machinery, New York, pp. 79-84. Sweeney, T. (1997). Digital imaging, multimedia and museums of the future, in Earnshaw, R. and Vince, J. (eds. ), The Internet in 3D: Information, Images and Interaction, Academic Press, London, pp.365-375. Uphill, E.P. (2000). Pharaoh´s Gateway to Eternity, The Hawara Labyrinth of King Amenemhat III, Keagan and Paul, London. Worden, S. (1997). Thinking critically about virtual museums, Archives & Museum Informatics, pp.93-103. Copyright © 2000 Narushige Shiode and Wolfram Grajetzki. All rights reserved. Last updated on Monday, 20 November 2000.